Clifford Will is Distinguished Professor of Physics at University of Florida (2012-present). Other institutional affiliations include Washington University, St. Louis and Stanford University. His research interests include gravitational radiation, black holes, cosmology, the physics of curved spacetime, and the theoretical interpretation of experimental tests of general relativity. November 13, 1946Birth, Hamilton (Ont.). 1968Obtained BSc in Applied Mathematics and Theoretical Physics, McMaster University, Hamilton (Ont.). 1971Obtained PhD in Physics, California Institute of Technology, Pasadena (Calif.). 1971 – 1972Research Fellow and Instructor in Physics, California Institute of Technology. 1972 – 1974Enrico Fermi Fellow, Enrico Fermi Institute, University of Chicago. 1974 – 1981Assistant Professor of Physics, Stanford University, Stanford (Calif.). 1981 – presentAssociate Professor of Physics, McDonnell Center for the Space Sciences (1981-1985); Professor of Physics, McDonnell Center for the Space Sciences (1985-2005); Chair, Department of Physics (1991-2002); James S. McDonnell Professor of Physics, McDonnell Center for the Space Sciences (2005-2012); and James S. McDonnell Professor of Space Sciences, Emeritus (2012-present), Washington University, St. Louis, St. Louis (Mo.). 1984 – 1986Chair, Committee on Accuracy of Time Transfers in Satellite Systems, Air Force Studies Board, National Research Council. 1986 – 1988Member, Astrophysics Management Operations Working Group, Astrophysics Council, National Aeronautics and Space Administration (NASA). 1988 – 1990Member, Introductory University Physics Project, American Association of Physics Teachers. 1988 – 1990Member, Executive Committee, Astrophysics Division, American Physical Society. 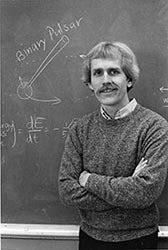 1988 – 1991Member, Science Coordinating Committee for Experimental Gravitation, National Aeronautics and Space Administration (NASA). 1989 – 1991Member, Space Science Working Group, Association of American Universities. 1990 – 1992Member, Committee on Fundamental Constants and Basic Standards, National Research Council. 1992 – 1993Member, Theory Panel, Satellite Test of the Equivalence Principle, National Aeronautics and Space Administration (NASA). 1992 – 1993Member, Task Force to Review Reviews of Modern Physics, American Physical Society. 1994 – 1996Member, Education Committee, American Physical Society. 1995 – 2004Member, Governing Committee, International Society on General Relativity and Gravitation. 1996Research Associate, Centre National de la Recherche Scientifique. 1997Visiting Professor, Racah Institute of Physics, Hebrew University. 1997 – 1999Member, Discipline Working Group, Microgravity Physics, National Aeronautics and Space Administration (NASA). 1997 – 1999Member, Committee on Gravitational Physics, National Research Council. 1998 – 2007Chair, Science Advisory Committee, Gravity Probe B, National Aeronautics and Space Administration (NASA). 2000 – 2001Chair, Topical Group on Gravitation, American Physical Society. 2000 – 2002Member, Committee on Physics of the University, National Research Council. 2000 – presentMember, Gravitational Wave International Committee. 2001Fellow, American Academy of Arts and Sciences. 2004 – 2007President, International Society on General Relativity and Gravitation. 2006 – 2007Member, Beyond Einstein Program Assessment Committee, National Research Council. 2006 – presentResearch Associate, Centre National de la Recherche Scientifique. 2007Member, National Academy of Sciences. 2012 – presentDistinguished Professor of Physics, University of Florida, Gainesville (Fla.). PhD advisor at California Institute of Technology, "Theoretical frameworks for testing relativistic gravity; the parametrized post-Newtonian formalism." Both employed at California Institute of Technology. Both employed at University of Chicago, Enrico Fermi Institute. Obtained PhD (1971). Research Fellow and Instructor in Physics. Visiting Professor, Racah Institute of Physics. Associate Professor of Physics, McDonnell Center for the Space Sciences; Professor of Physics, McDonnell Center for the Space Sciences; Department Chair; James S. McDonnell Professor of Physics; McDonnell Center for the Space Sciences; and James S. McDonnell Professor of Space Sciences, Emeritus. Member, Introductory University Physics Project. Fellow; Member, Executive Committee, Astrophysics Division; Member, Task Force to Review Reviews of Modern Physics; Member, Education Committee; and Chair, Topical Group on Gravitation. Member, Space Science Working Group. International Society on General Relativity and Gravitation. Member, Governing Committee and President. Member, Gravitational Wave International Committee. Obtained BSc in Applied Mathematics and Theoretical Physics (1968). Chair, Committee on Accuracy of Time Transfer in Satellite Systems, Air Force Studies Board; Member, Committee on Fundamental Constants and Basic Standards; Member, Committee on the Gravitational Physics; Member, Committee on Physics of the Universe; and Member, Beyond Einstein Program Assessment Committee. Member, Astrophysics Management Operations Working Group, Astrophysics Council; Member, Science Coordinating Committee for Experimental Gravitation; Member, Theory Panel, Satellite Test of the Equivalence Principle; Member, Discipline Working Group, Microgravity Physics; and Chair, Science Advisory Committee, Gravity Probe B.
Marcia Bartusiak interviews conducted for her book "Einstein's Unfinished Symphony," 1998-1999. Was Einstein right? : putting general relativity to the test / Clifford M. Will.